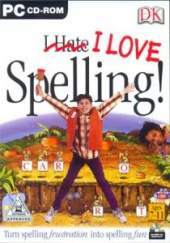 Turn those words, "I Hate Spelling" into "I Love Spelling!" with this unique learning adventure. This is a spectacular animated adventure that teaches and tests spelling for children aged 7-11. Players take part in an intergalactic game show adventure, playing challenging spelling games on weird and wonderful planets, and meeting their funny inhabitants. Children can customize the games by choosing special word groups to play with - names of their favorite animals, parts of the body, country names and many more. Teachers and parents have access to more than 50 spelling-pattern word groups that target key spelling problem areas. Packed with hundreds of hilarious animations and jokes, it makes learning to spell more fun than it's ever been! It features: Planet Aquatica - Burst bubbles to spell the words you hear on Aquatica; Planet Amphibia - Ready for a spelling spree? It's guess-the-mystery-word time; Planet Anagrama - Can you sort out the jumbled-up letters to make a word on Anagrama; Shooting Stars - Burst a star and test your spelling to win extra points; Planet Arachna - Spell the words you hear on batty, buzzing Arachna. But watch out for the spiders. It has 5,000 essential spelling words graded into three difficulty levels, 50 spelling-pattern word groups that target key spelling problem areas, more than 100 fun themed work groups that children love, misspelled words automatically recycled and practiced, and intelligent tracking software allows you to target words you have problems with.